Is it okay to exhale? It looks like the awful May jobs report could be an aberration. 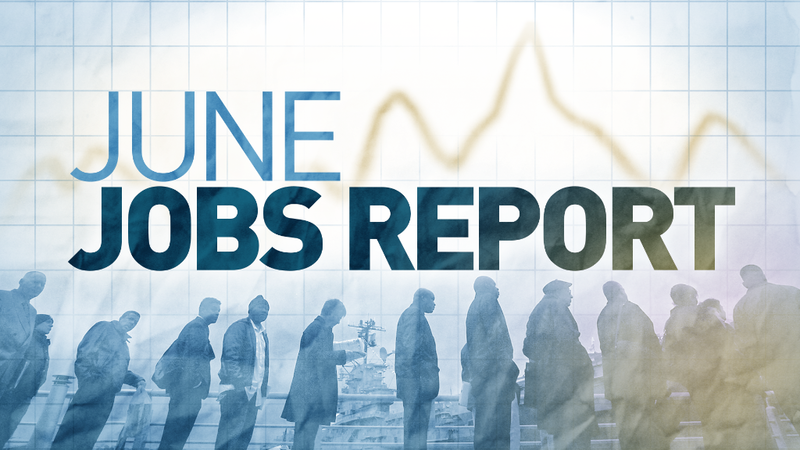 Investors were breathing a big sigh of relief after the government reported that 287,000 jobs were added in June. Stocks surged on the news, putting the Dow and S&P 500 within spitting distance of all-time highs they last hit in May 2015. "Boy, we're happy to see this jobs number," said Barbara Reinhard, head of asset allocation for Voya's multi-asset strategies and solutions group. And bond yields actually fell slightly, an indication that investors believe the Federal Reserve still won't be in any hurry to hike rates just yet. "The labor market is growing at a healthy pace, which is good for stocks, but it doesn't bring the Fed into the equation as a threat to raise interest rates," said Robert Tipp, chief investment strategist and head of global bonds for Prudential Fixed Income. And with the U.S. presidential election less than four months away, many experts are beginning to wonder if the Fed will want to raise rates at all before November ... unless it's absolutely necessary. "A rate hike from the Fed is off the table until at least December," said Tom Anderson, chief investment officer at Boston Private Wealth. Related: When will U.S. stocks break free and hit new highs? He thinks it's far more likely that the next Fed move will come after Hillary Clinton or Donald Trump is inaugurated. That's good for stocks as well. Still, it's not all sunshine, puppies and kittens on Wall Street -- despite the big rally on Friday. Brexit concerns may be fading further into traders' rear view mirrors. But they haven't gone away for good. The sense of calm could be fleeting. Earnings "season" begins in earnest next week, with Alcoa (AA), Yum! Brands (YUM), Delta (DAL), JPMorgan Chase (JPM), Citigroup (C) and Wells Fargo (WFC) all posting results for the second quarter. Executives may be guarded when they discuss their outlooks for the rest of the year, because there still are a lot of questions about how and when Brexit will actually happen. "CEOs are going to be asked questions about Brexit. But how the heck will they know what the impact will be? There isn't even a new leader in the U.K. yet. Expectations should continue to be low," said JJ Kinahan, chief strategist at TD Ameritrade. Related: Brexit is killing big bank stocks. 2008, part 2? Kinahan added that as long as interest rates remain near zero in the U.S., that's bad news for banks. And he thinks it will be tough for the broader market to keep rallying if financial stocks remain in the doldrums. There are lingering worries about the health of China too. Add that all up and it's still tough to get overly bullish about stocks. "The Fed is still somewhat concerned about the post-Brexit world. Italian banks may need capital injection at some point," Reinhard said. "The rest of the world still bears watching."